Dr. Franciscus Sylvius was, in an oft-repeated, and just as oft-debunked, narrative the person who invented gin. Sylvius Gin is named for this man. He did his work in the 17th century, at least a couple centuries after the first juniper berries were distilled with a grain spirit. Doesn’t matter, we won’t hold it against this gin which bears his name. If you can read Dutch, Jenever in de lage landen has the most thorough dismantling of the myth. The nose begins with caraway, cinnamon and a hint of citrus. Anise-like notes, with grain and caraway, creating an illusory low note reminiscent of rye bread. The palate starts with a sharp caraway note, but considerable depth emerges: floral notes along with juniper come through in the mids. The finish has a lot of spice notes, as caraway comes through again, but this time with sweet licorice and fennel notes as well. 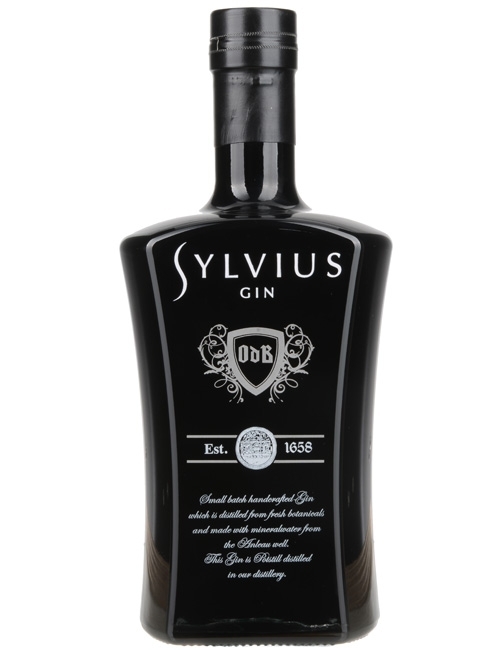 Sylvius gin is a spice-forward contemporary style gin. Nice on its own with bright caraway, anise and spice notes that don’t overwhelm. We’d look to try this in a Martini or Negroni. More a gin than a Genever, Sylvius Gin merges some of these best aspects of both. It’s nicely balanced, and perhaps worthy of a name of better stature in the gin community than Sylvius Gin. The gin is not “Holland Gin” but “London Dry Gin”. It’s single distilled, no sugars, un (chill) filtered, at a strength above 70% (after distillation and diluted to 45%). On the name Sylvius. As stories go, there were 2 Dr.s Sylvius who operated in the city of Leiden. One around 1550, and one in 1650. Up till today you might visit the Sylvius Laboratory. The name Genevre was coined by Dr. Sylvius, the one in 1650, for distillates containing juniper. Hence the birth of genever as a category. Our distillery started distilling in Leiden (as the only distillery there) in 1658. So there is some relevant historical link between the two and we decided to name our gin after our heritage ánd the heritage of genevre. The difference between Gin and Genever is the presence of Moutwijn (malt-spirit) in genever. And genever has a lower percentage of botanicals per litre. Genever is therefore more of a mix between gin and whisky as Moutwijn is basically whisky, only the yeast is different. Holland Gin, or Genever, is always with this ingredient Moutwijn, and by flavour completely different as gin. We’re proud that we achieved this delicate balance between the alcohol percentages and the flavours it opens. If you dilute it even further, down to 1:10, orange is the dominant flavour. Thanks for clarifying on your gin’s origin story. I appreciate that, and did not mean to contend why you named your gin that way, but simply to point out that for gin-readers who’ve read many of the same books I have, that misconception might be the first thing that came to mind. Thanks for your reply, Much appreciated! I didn’t want to patronize or anything likely to that at all. Our distillery is also producing 2 genevers next to this gin. So we’re pretty ‘on the detail’ when it comes to the two categories. In Holland and Belgium there’s a whole bunch of genevers who don’t really use moutwijn so much. This is all due to price pressure. Our genevers are high in moutwijn dose and therefore more flavoursome (we think) and our mission is to explain the crowd what real genever is, could be, and should be. However, I’ll make sure you’ll get a sample of our genever as well as a bottle of Sylvius. Can you email me your packages-address? Yes, send you an e-mail. Thanks so much, looking forward to trying your genever as well!